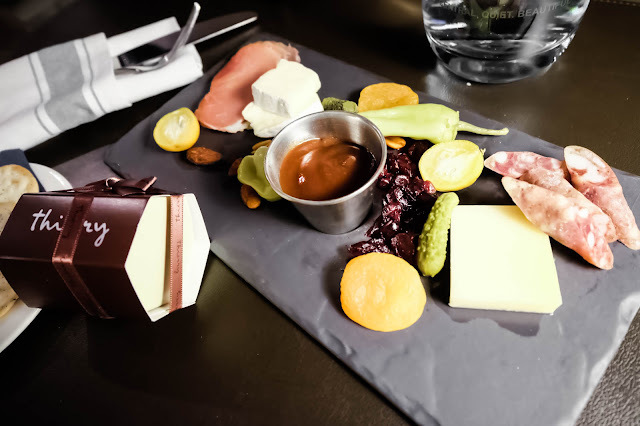 Loden is easily one of my favorite hotels in Vancouver. 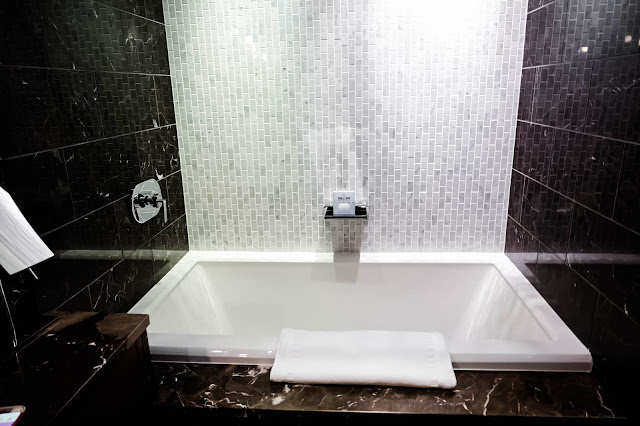 It wins by its SUPER attention to details and giving a personal touch to many of the amenities you may find standard else where. 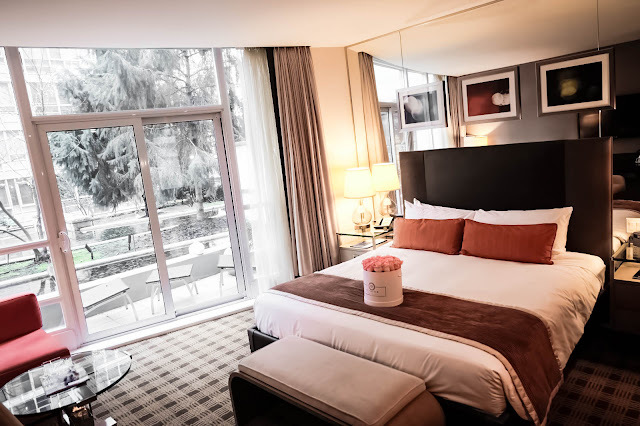 We stayed at the Garden Terrace Room for Valentine's Day last year and it was so wonderful. Our room looked very spacious (and romantic) with the floor to ceiling glass door leading out to a private patio, then to the urban garden. These Garden Terrace rooms are located on the 2nd floor Sanctuary where the urban garden is located. If you open that glass door, you'll be able to take in sight a peaceful reflection pond with the sound of a small relaxing waterfall. 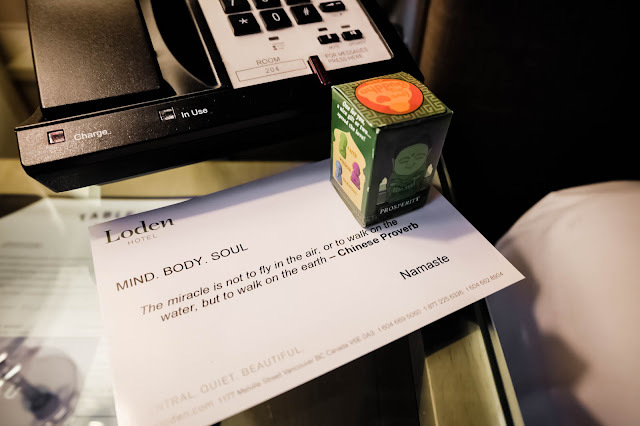 Loden seems to have a great emphasis on zen, wellness and relaxation. 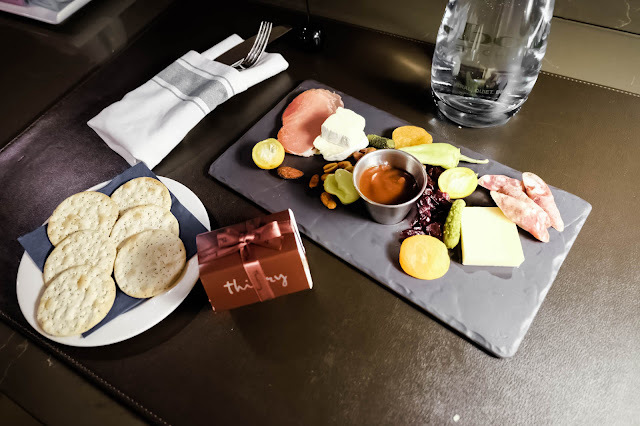 The room includes many yoga-inspired details such as this adorable little welcome gift ! It's a tiny Buddha figure that blesses prosperity. There was also yogi tea, a popular yoga magazine, and yoga props all complimentary for your use. 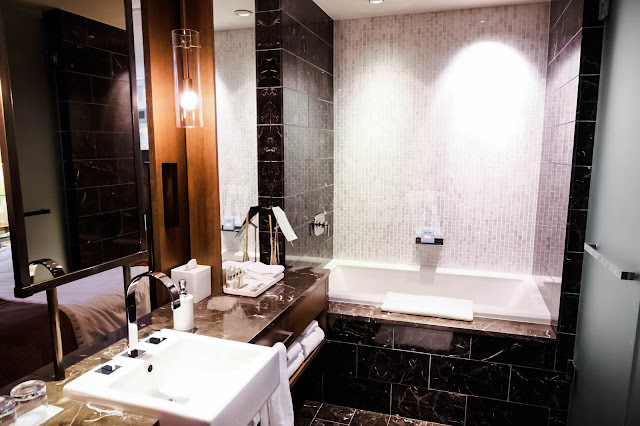 In addition to these thoughtful amenities, Loden also offers a program called the WanderFIT. 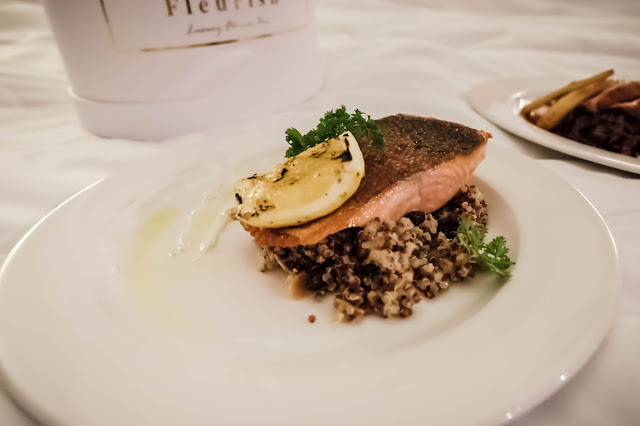 It is tailored for people who wish to stay fit during traveling, and at the same time, experience the wellness aspect of the West Coast lifestyle. During your stay, you can sign up to privately guided fitness "tours" to go cycling, trekking, and hiking with professional WanderFit experts that brings you to explore both the urban and natural beauty of Vancouver. 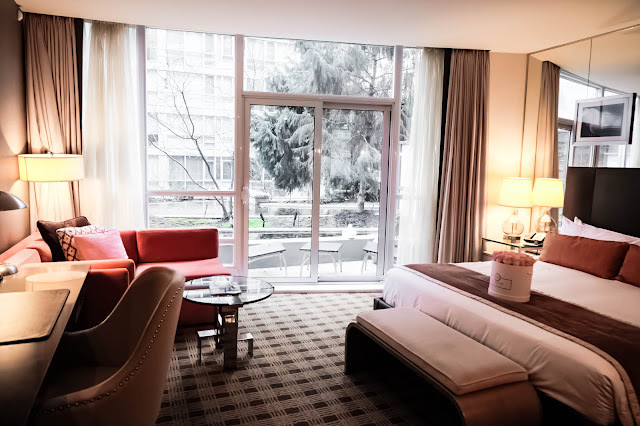 Of course, there is also the standard gym room, spa, and sauna you can enjoy within the hotel. The room was well lit thanks the the big glass door. The king bed was so comfortable with just the right number of pillows, and the blanket was just the right heaviness to make you feel so cozy, but not stuffy. Hmmmm, I miss that bed as I type. Although we didn't bring Coco with us during our stay. 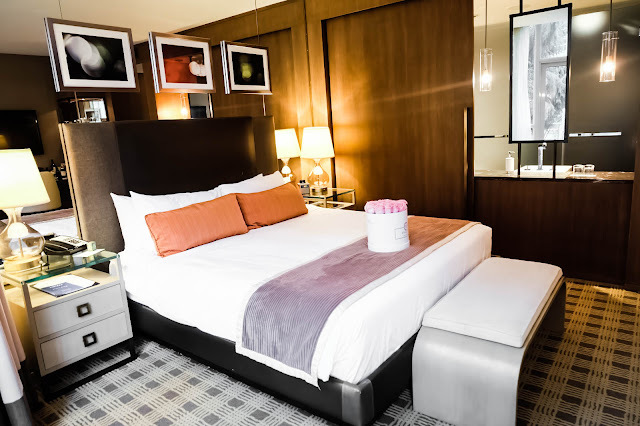 Loden is indeed pet friendly, and pets are greeted with their very own amenities, including a luxurious plush pet bed, food bowl, and a Loden leash ! How adorable is that ! 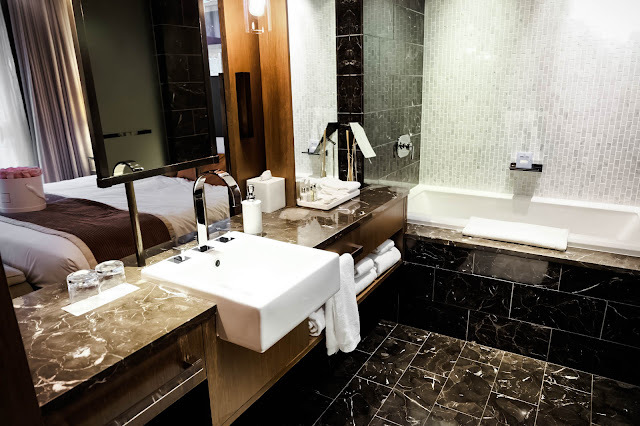 The washroom is connected to the bed area, which I love. 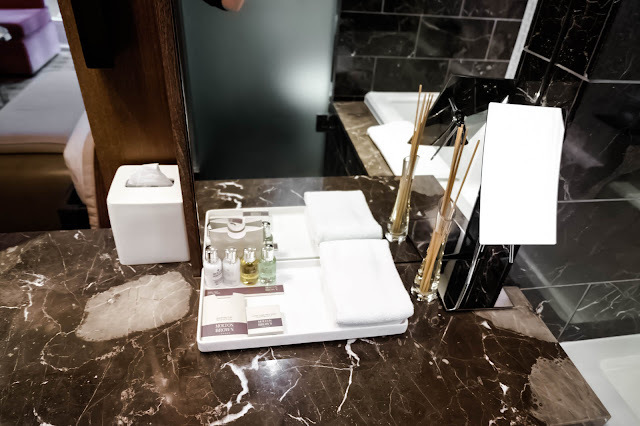 It's very modern with expensive toiletries. The big tub was deep and perfect for soaking after a day of outdoor activities. 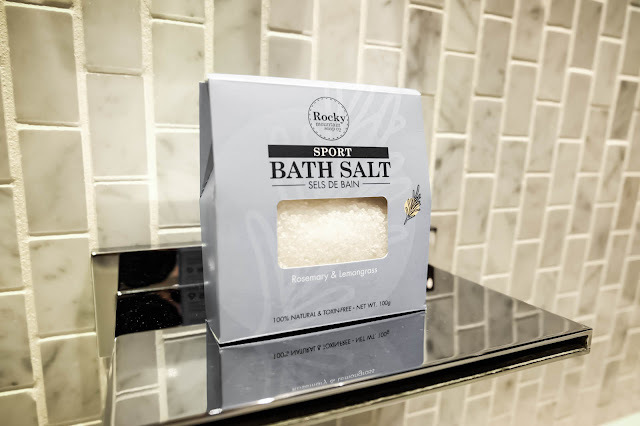 Loden even provides you Epsom salt to relax your muscles ! I seriously was very impressed by all these little touches the hotel paid attention to. 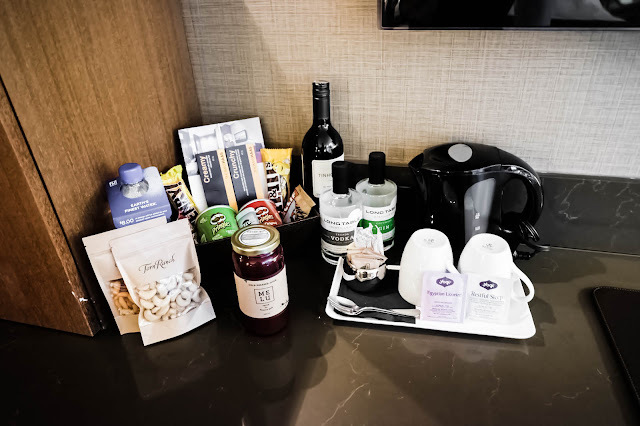 These thoughtful details differentiates Loden from all the big name hotels out there, in the most positive way. 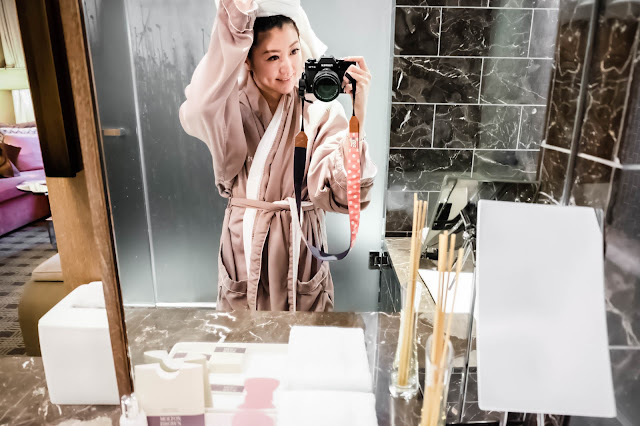 It feels like a (very) accommodating friend who goes out of his way to provide you a comfortable and luxurious stay, and at the same time, feels like home. The customer service, was needless to say, impeccable as well. During our stay, we really felt like each staff was willing to go above and beyond to make our stay as memorable as possible. The hotel further offers complimentary Electra-Townie bikes for you to explore the city on paddles. It even has a VERY CUTE heritage looking Loden Cab that offers complimentary drop-off service to take guests anywhere in downtown ! Where can you find services like ? 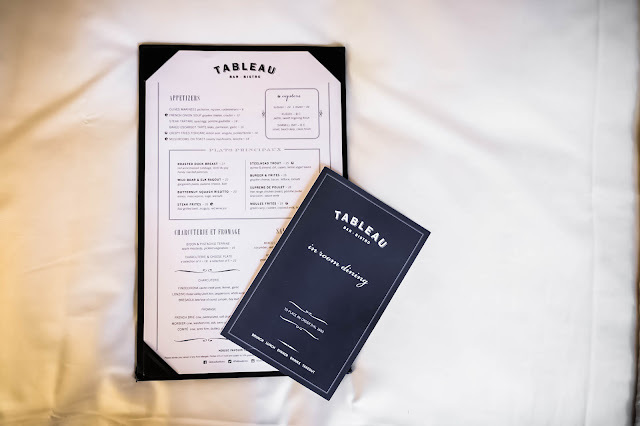 Aside from the welcome cheese plate and a small box of one of Vancity's most famous macaroons, Loden's room service is provided by their very own restaurant, Tableau ! AND I LOVE TABLEAU. And I love it even more when I can enjoy Tableau in the comfort of my room ! 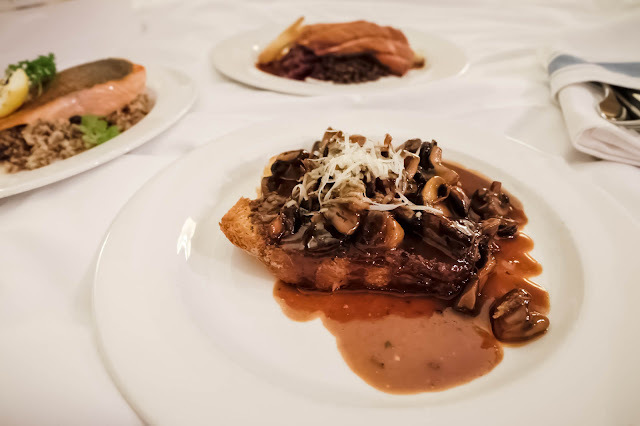 This mushroom toast thing was SOOOOOOOO DELICIOUS as an appy. I forgot what it was called on the menu but just order the mushroom toast thing , you will thank me with your life. 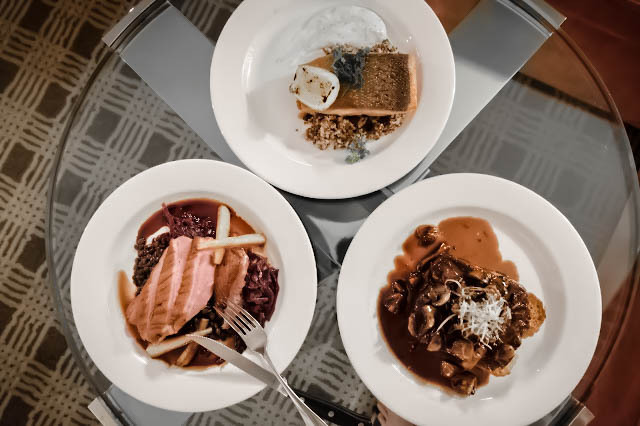 $50 food and beverage credit so you can decide how you wish to spend your evening, whether it’s a bottle of wine from our mini bar, or cocktail for two at our hotel restaurant Tableau Bar Bistro. 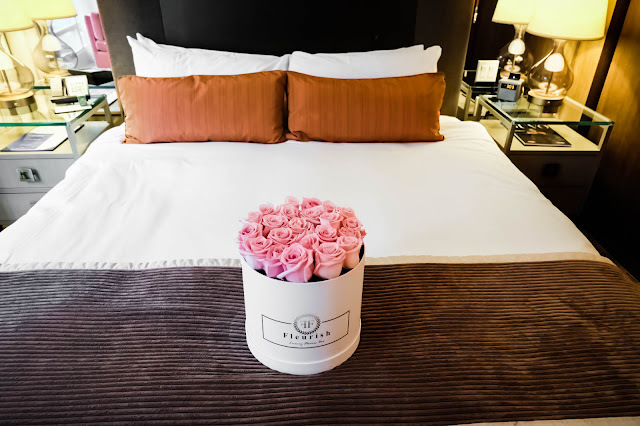 Surprise in-room romantic gift to spice up your evening! (hint: there is a spicy theme involved, delicious treats such as macarons and alcoholic beverages). 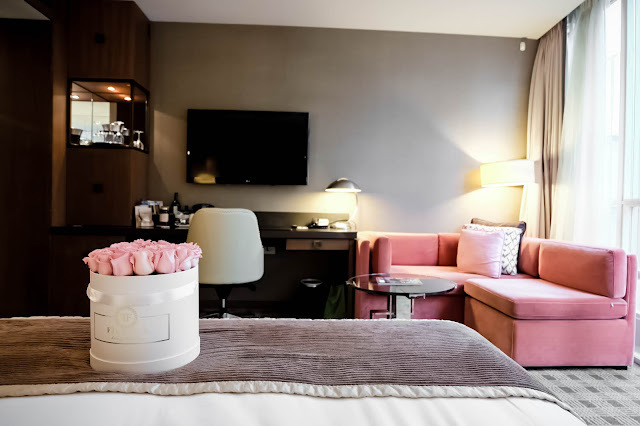 Loden Romantic Turndown upon arrival, which includes satin rose petals on your bed and other romantic touches in your Guest Room. 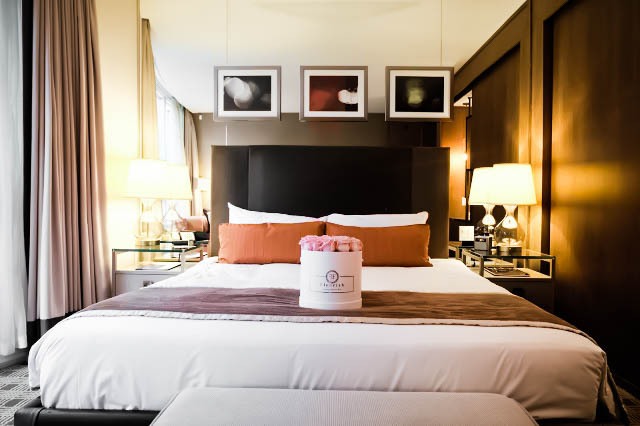 Complimentary Loden Cab drop off service throughout your entire stay – we can drive you into downtown for your afternoon/evening of romance, or you can enjoy our library of movies if you decide to stay in and get cozy.